Kremenchuk, Ukraine - Since boyhood I'd held an image of Kremenchuk: a cold, severe, communist place, with snow falling. It was only a village in my mind. There, a bonfire burned, 1,000 villagers stood beside it, rubbing their hands to keep warm, and every one was named Pomerantz, or at least Pomeranietz. All were my kin, and when they saw me, they would know me. But now I'm an adult and I'm here, really here, in Grandpa's town. It's bigger than I imagined, a town of 248,000, full of factories. But it is a Jews' town no more. The old immigrant grandfather I barely knew has been dead 30 years. Yet I have come, with my father, to look for him, through the dense mist of time and blood ---much of it Jewish blood ---back past Yeltsin, and the fall of communism, and past Khrushchev, and even past Joseph Stalin and his purges, to the time of Czar Nicholas, his army and his pogroms. We are looking for Grandpa, for a piece of ourselves and our Jewish heritage. Also for our name (Was it changed at Ellis Island?) and for the street address, hard by the Dnieper River, where Grandpa said he lived as a boy: 22 Yevreyskaya Ulitsa. Now it is a Friday night service, the sabbath candles are burning low in front, as Dad and I sit before 70 Ukrainian Jews. They have old, craggy faces and smiles marked by gaps and gold. Hearing of our presence, they have called for us to come from our seats in back. They seem awed by the sight of amerikansky visitors, and we are equally awed by the sight of them. We sit in a community center auditorium because the historic synagogue down the street, built in 1851 and almost certainly attended by Grandpa, is a burned-out hulk, vandalized three years ago. Once this city had six synagogues, 31 prayer houses and 22 schools known as yeshivas. Now, all are gone. These Ukrainians are full of questions about America. Through our interpreter, they ask, is there much anti-Semitism there? Are many Jews working in Hollywood? (Dad mentions Steven Spielberg, a name they seem to know.) A man asks Dad how much he knew about Hitler's extermination program early in the war. "Very little," Dad replies, "since I was only 9 or 10 years old." The man seems disgusted, convinced at least that FDR knew more than he let on and allowed Jews to perish. We tell them why we have come: mishpucha, or family. They tell us there are no Pomerantzes left in Kremenchuk, or any Jews with similar names. The records are all gone (Hitler's tanks and bombs did that) and so are the Jewish storytellers, emigrated with their memories to Israel and America. In Grandpa's day, Jews composed nearly half of Kremenchuk's 88,000 residents. Today fewer than 5,000 Jews remain. A woman says that as a schoolgirl she often walked past a fine home with a mailbox marked " Pomerantz." That was in 1926, long after Grandpa and his family left. Yet it's enough to make me believe that our name might not have been changed by some clerk in the New World, after all. We ask about Yevreyskaya Ulitsa. The reply is that this very street, Kvartalnaya Vulitsya, once was known as Yevreyskaya Ulitsa, but that that was only a nickname among Jews. A man with a handlebar mustache stands and says, "Nyet! Nyet! Nyet!" The old Yevreyskaya Ulitsa was not here, he insists, but several blocks away, on what is now 1905 Vulitsya. A spirited debate ensues: Where was Jews Alley? We had flown 14 hours from Atlanta, then driven three hours more from Kiev through the Ukrainian farmlands to get here. Yet now the only Jews on Earth who can tell us offer two answers, not one, and so it's a mystery still, like Grandpa himself. In these people, their manner and looks, I see Grandpa. Through them, my heritage, once an abstraction, comes to life. Had Grandpa stayed here, this is how he would've looked and acted. And as I'm listening intently to these wonderful, proud, barking Ukrainians, I feel a catch in my throat, and suddenly I realize that I am crying. Grandpa was an Old World man and, God knows, he had Old World habits. He smoked Denoblis, cheap, thin Italian cigars that had a rancid smell, and he never smiled in family photographs. His name was Philip Pomerantz, and in October 1912, at the age of 13, he arrived at Ellis Island with his sister Rose and widowed mother, Dora. It must have taken some doing, and some money, to slip out of what was then Russia. Before their boat passed Lady Liberty, someone opened a Torah and gave Grandpa a bar mitzvah. 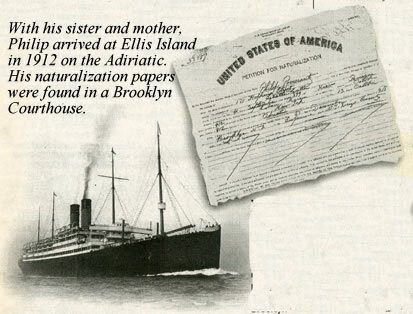 At Ellis Island, his two older brothers came to retrieve them. Louie and Yurna had arrived about two years earlier to avoid conscription in ---or persecution by ---the czar's army. They had set up an apartment at 75 Johnson Ave. in the Williamsburg district of Brooklyn. Grandpa would marry, have two sons, and work classic immigrant jobs as a leather cutter, cabdriver, bakery manager and hospital orderly. I was 7 in the spring of 1968 when Grandpa dropped dead of a heart attack at the age of 68. Two heart attacks, really. The first he survived long enough to say to a nurse, "Get me a pencil, a pad and a blonde." The second came hours later. He was buried in a Jewish cemetery on Long Island, N.Y.
Tell us a story, Daddy. My sons make the same demand every night. Usually I make up a story about spaceships, dinosaurs or lava. But once I told a true story: "A long time ago, there was a mean Russian czar who had mean soldiers who scared a little boy and his family so much that they ran away. They got on a boat, crossing the ocean for days, and finally came to America to be free." "Well, his name was Philip Pomerantz, and he's the guy who gave you your last name." I can't. I don't know any more. I wanted to know more. Deep down, I wanted to place myself, as both an American and a Jew. I've never questioned my Jewishness, any more than I have my Americanness. But once my maternal grandmother, hearing me announce my engagement, asked, "What's her name?" She said, hopefully, "Could be." "It's not, Grandma," I said, and she slumped in her chair. All five of her grandkids, including my two brothers, married outside the faith. More than half of American Jews today marry non-Jews, producing in the rabbinate a fear that interfaith marriage will cause Jewish heritage and traditions to diminish, then die. I've heard an Atlanta rabbi sermonize that Jews like me don't have "a Jewish identity" but rather a "Jewish identification." He likened it to a Braves fan who identifies with the team but isn't a player. Such a thought is a pathetic indignity, an intramural form of anti-Semitism. Bar mitzvahed at 13, I have spent little time in synagogues since, but ask me what I am and I shall reply, proudly, "I am a Jew," same as my parents, grandparents and great grandparents. It is my heritage ---and, yes, my identity ---and one day my three children will know it as part of theirs, too. How dare he tell me who I am, and what I am not? I called my father, Ed, a 67-year-old marketing executive in Los Angeles and the last surviving member of his family. I said, "Let's go to Kremenchuk, Dad." He had never been there, never even thought of going. "Are you serious?" he asked. No one ever called my father shy. At a party, or a business convention, he can work a room. When I was little, he was quick to hug or tickle me. Then he coached my Little League teams. A rock-solid dad, always there, he wore a thick gold ring that once was his father's. But when I pull out my tape recorder and ask him questions about Grandpa, an unprecedented silence falls upon him. 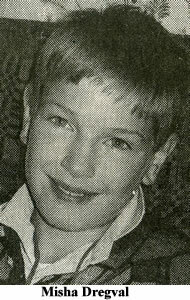 "I didn't really know that much about him," Dad admits. I asked questions I should have asked long ago. I am told that Grandpa was proud that his two sons were college graduates, and that he liked his Reader's Digest, his Denoblis and his vodka, and that occasionally he sang Yiddish melodies. I am left not with memories of him, only an image: a short, stout man, sitting on the couch, saying little. He spoke hardly at all of Kremenchuk, other than to suggest it was "somewhere between Minsk and Pinsk," a fib that rhymed. Grandpa sometimes spoke of his mother's bravery and business shrewdness. Once, he said, two of the czar's soldiers came into the family dry goods, or hardware, store in Kremenchuk in search of illegal vodka. Under the counter, they found it. "Now, I've got you," the soldier charged. But according to family lore, Dora picked up a small lead weight and smashed the bottle. The vodka emptied onto the floor. "Now, prove I'm selling vodka," she said. "You know what kind of guts it took for a Jew in Russia under the czar to do that?" my cousin Sadie, 82, says. Stories in our family suggest that Grandpa, his mother and sister first sailed to Argentina. They were denied entry because of an outbreak of disease aboard the ship. So they sailed back to Europe, though precisely where we don't know. On Oct. 3, 1912, they boarded the Adriatic in Liverpool, England, stopped in Queenstown, Ireland the following day and arrived in New York on the 13th. On board were Irish, Brits, Swedes, Finns and Russians. Under the category of "Race of People," the passenger list cited my relatives as "Hebrew" with their Hebrew names Dwosse (Dora), Raitza (Rose) and, for Grandpa, Pine (pronounced Pin-ya), which became Philip. As we boarded the plane for Kiev, I thought about something my Aunt Ruth had told me: When Grandpa died, his two sons didn't really know what to tell the rabbi to say in his eulogy. And so the rabbi said that Grandpa was a good man who loved his family and worked hard. Nothing more. Preparing for our trip to Ukraine, my father found, then struck up an Internet friendship with, a Kremenchuk businessman named Nicolay Dregval. Nic, as he is known, mentioned that his 12-year-old son, Misha, was taking English lessons and would love an American pen pal. My father suggested Ross, my 8-year-old son. So began the magic of modern technology: e-mail pen pals, an Atlanta schoolboy conversing with a Ukrainian boy living in the very town the American's great-grandfather fled 85 years ago. Wrote Ross: "I have a computer game called Civilization. Lots of time my team is the Russians. And I usually win. Sometimes, I'm the Babylonians." Replied Misha: "I have computer game coled (sic) Civilization, too. I like to play in it very much. But my favorit game is Warcraft." That is also Ross's favorite game. "Which team do you like ---Human or Orc?" Ross wrote. Their exchanges over the months were priceless. Ross: "Do you have curly hair?" Misha: "I have curly hair not." Ross: "Who is your favorite athlete?" Misha: "My favorit plaer is Mishel Jordan." Misha added that he has seen Chicago Bulls games on TV. Ross signs each e-mail the same way: "From Your Pen Pal in America." And Misha signs: "From Your First Friend in Ukraine." Nic also was moved by these exchanges. "The world really (is) getting smaller," Nic wrote. "Recently USA also were far as Mars. KGB preserved us self-denyingly against 'decomposing influence of West.' Now people open eyes on the world." We arranged to meet Nic and Misha on our Kremenchuk visit. On a bright autumn morning, we set out by car from Kiev. We saw farmers working in the countryside, old men riding bicycles, a donkey pulling a cart filled with vegetables. By the roadside, a few old women, hunched over on stools, hoped to sell baskets of eggs. 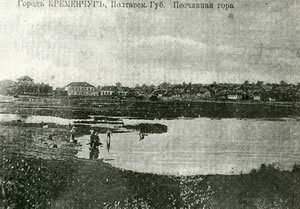 Kremenchuk is a river port and manufacturing center in the Poltava region. It 's filled with brick apartment buildings and more than 200 factories producing chemicals, cars, trucks and cigarettes. It's a gray place with the feel of Pittsburgh. In Kremenchuk, you can still feel the rumble of the Nazi war machine. The city is 427 years old, yet there's hardly a building older than 50 years. The Nazis, upon ending their occupation, destroyed 97 percent of the town. They carpet-bombed it. Even the old graveyards are no more. We arranged to visit Kremenchuk's deputy mayor, I.I. Malyarenko. His office is adjacent to Victory Square, where there looms a tall granite monument to Lenin, in his trench coat. Malyarenko, a serious man with four gold teeth and blue eyes, opened a bottle of champagne. He toasted, "To you, Kremenchuk natives, and your continued health!" Three times, he told us, "We welcome Americans and would like business relationships." Chain-smoking, he explained that 19,000 Kremenchuk workers are unemployed and that the number grows each day. "There is no communism and no capitalism. Just a big mess," Malyarenko says. "Nobody knows what to do." But Malyarenko terms these "temporary difficulties." He says, "We hope to accomplish things little by little. In near future it will be different. We need new technology and business. We have people willing to work." short, bulbous man who immediately is smitten with our interpreter, Angela Lipnitskaya. An energetic, 24-year-old Ukrainian Jew whose family emigrated to Atlanta in 1990, she is a student at Georgia State University. The mayor invites us to lunch. Borscht is served, and never before have I seen anyone assault borscht quite like Mayor Ivan Ponomarenko, his face so low to the bowl it seems as though he's searching for a coin. He is lapping up the borscht, chewing it, and as he does, he suddenly throws an arm around Angela's neck and says, "I love Jewish women! All Jewish women are beautiful!" Ponomarenko offers to help us look for our relatives through official Ukrainian records. He puts in a call to Poltava. But when Angela gets on the line with the archivist there, she hears,"Philip Pomerantz? Sounds like he was Jewish. Was he born Jewish?" Angela confirms he was. "Unfortunately all Jewish books and archives were destroyed in the war," the archivist says. "We cannot find any Jewish names." “Nothing?" Angela asks. "Nothing," the woman replies. Early one morning, I hear a knock on my motel room door. It's my father, and he hands me a small jewelry box. "Here, I want to give you this," he says. Inside the box is an old and scuffed gold ring with a single diamond and the initials "PP." I recognize it at once as Grandpa's. Dad's been wearing this ring since 1968 when he pulled it off his dead father's finger as an enduring memory of an enigmatic man. If you look carefully, you can make out the shape of a mermaid, raised from the ring's surface, on the side, next to the initials. "I thought Kremenchuk was the perfect place to give this to you," Dad says. "And today's the perfect day ---Grandpa's birthday. "He would have been 98 years old." "Are you sure you want to give this up?" I ask. Dad nods. I slide the ring on my finger; it's about three sizes too big. Dad says, "Now it ought to be good for at least another 30 years." I feel suddenly closer to my grandfather. By giving me the ring, I sense that Dad feels closer to Grandpa, too. One day, I know, this ring will belong to one of my sons. Our driver is Vladislav Fedchenko, a 32-year-old Kiev native, a handsome man with high cheek bones and an easy manner. Vlad speaks little English but understands plenty. Over lunch, we are talking about the brutality of Ukrainian history. In what has been an emotional trip back to her native land, Angela begins to weep. That day, she had found her own grandfather's name on a list of Jews killed during World War II at Babi Yar. There, more than 150,000 Kiev residents ---the overwhelming majority Jews ---were executed by the Nazis, their bodies thrown into mass graves. Suddenly, Vlad speaks. Softly, he tells us this talk about our grandfathers has made him think of his own, whom he never knew. One day in 1937 my grandfather just disappeared, Vlad says. He was a member of the Communist Party, in a branch that organized teenagers. Somehow, he had become known as an enemy of the party. My father, Vlad says, was only a year old when his father was taken away. Adriatic About 20 years later, Vlad says, his eyes reddening, Grandmother received a letter that said her husband was dead. The letter didn't say when he died or how. Just that he was dead. Now, Vlad looks at us and says, At least you have somewhere to look. I have only that piece of paper. Now, I'm thinking, "What if Grandpa hadn't gotten on the Adriatic?" Vlad's grandfather and Angela's grandfather remained in Ukraine during murderous times and paid the ultimate price. With shots of vodka, we raise our glasses. The solemn toast is mine: "To our grandfathers." We climb four cold, cement flights of steps to get to the Dregval apartment. It is a dank place with three cramped rooms. Here, Nic and his wife Nadia live with their only child, Misha. Nic and Nadia are 41-year-old engineers. She works in a truck factory, he for an auto parts company, and they earn a combined $ 250 per month. If they are lucky, Nic says, they end up the year with about $70. Sometimes, Nic walks more than 2 miles to work. They greet us nervously, then feed us like kings. With their extended family ---Nic's sister Svetlana, her husband Sergey and their daughter Katia, and Nic's parents Nina and Evgeniy ---we crowd around a table filled with stuffed peppers, pelmeni (dumplings), cabbage, beet and spicy carrot salad and enough vodka to float the Ukrainian fleet. They toast us, we toast them; and then we do it all over again, until the night is old and the words slur. Misha, who sends his e-mail to Ross from a computer in Nic's office, is a gorgeous-looking kid, all boy, with mischief in his smile. I'm struck that he's virtually the same age as Grandpa when he left for America. We exchange gifts: Misha gives me a wooden flute for Ross; I give Misha an Atlanta Braves T-shirt, wads of bubble gum and a Michael Jordan stopwatch. In English, he says, "Thank you." The Western influence is on his bedroom wall: a "Lion King" calendar, a poster of Arnold Schwarzenegger. I ask them about the city's Jewish community. 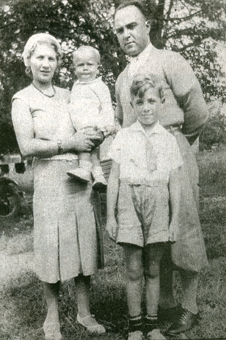 They say they know little of it, though Nic's mother and stepfather recall vividly the Nazi occupation of Kremenchuk. As a small girl, Nina recalls hungry and angry dogs barking at Nazi motorcycles. She hid underground and her home was destroyed. Evgeniy recalls a Nazi with an odd hobby: "Whenever he got drunk, he shot chickens. Blood everywhere. Blood, blood." Thinking of the Jews, Evgeniy sighs. He stares for a moment at the ceiling, a tear forming in his eye. "They had lists of all the Jews in town," he says. The next day he takes us to a field where Jews were shot. "The Nazis usually did it at night," he says. "So you wouldn't see it." We offer to take the Dregval family to dinner, and they accept. They walk about 1 1/2 miles to get to the restaurant. It's the only restaurant in town they know ---and they've only been there once before. We talk, laugh and drink more vodka. Before we leave, Dad and I give, in separate envelopes, a $ 50 bill to Nic and Nadia and a $ 50 bill to Svetlana, for their kids. Nadia weeps as she thanks us. Svetlana bursts out, "I give English lessons now to Katia!" Before leaving, we embrace the Dregval family, one by one. I tell Misha the next time I come to Kremenchuk I will bring Ross. Nic is smoking a cigarette with a look of sadness. He seems to doubt that we 'll ever be back. I tell myself, I will be back. Before attending the Friday night service, we go to what was, and what remains today, the heart of the city's Jewish community. At La Chaim, a community center next to the burned-out old synagogue, we speak with two leaders of the Jewish community, Anatoly Petrovsky and Boris Shipotosky. They tell us where to find Yevreyskaya Ulitsa. "It was right here ---this street," Petrovsky says. Shipotosky confirms it. The adrenal rush for me is instant. Dad and I walk outside. This street, a few blocks long and certainly small and thin enough to constitute an alley, suddenly has new meaning. There is an apartment building, a school, a grass field. Dad pulls out the camcorder and starts filming. Nearly in awe, he says, "I'm walking the same steps my father walked." We look for street No. 22 but find an empty field. "My father said they lived near the Dnieper. How close is it to here?" Dad asks. "Maybe 600 or 700 meters," Petrovsky replies. So we walk through a wooded area and are rewarded with a breathtaking view of the Dnieper River. We see a sandy beach, a row of umbrellas, a few fishermen. "I expected grimy barges," Dad says. "But this is beautiful." Later that evening, we are compelled to visit 1905 Vulitsya ---the other Yevreyskaya Ulitsa. We wanted to be sure we visited the right one. It is a much longer street than the first, maybe 1 1/2 miles in length. It's lined with one-story homes and a cigarette factory, and it dead-ends along the Dnieper. Again, Dad takes out the camcorder. I ask Vlad to come back in about 20 minutes. My Dad and I need a few minutes alone, I say. From my backpack, I pull out two cigars. I hand one to my Dad. "What's that?" he says. "You remember Grandpa by his ring," I say. "I remember him by his cigar." These are Cuesta Reys, Dominican made, certainly superior to Grandpa's Denoblis. "I haven't smoked a cigar in 30 years," Dad says. Then, he says, "You know, I really believed that first street was Yevreyskaya Ulitsa. But now I really don't know. How can you know? I guess it really doesn't matter, does it? What matters is that we made it here." I agree. We are touching Grandpa, if not truly seeing him. I feel the power and majesty of history, especially of Jewish history, which is my history. It is affirming. We sit on a few boulders, smoking our cigars. I thank Dad for giving me Grandpa's ring. It means a lot to me, I say. I'll take good care of it. Dad says, I know you will. The sun is setting over the Dnieper, an orange brilliance reflected in the waters, so bright it hurts the eyes. I feel closer to my father than at any other moment in my lifetime. 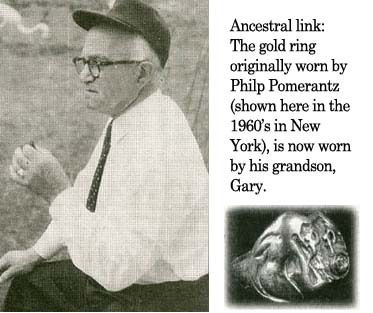 I ask about the history of the ring. It's probably 50 or 60 years old, Dad says. Dad says his mother told him she gave it to Grandpa as a gift. "But," Dad says, "Grandpa told me he found it in the back of his cab and then he had the initials on it changed." I laugh and ask, "Who do you believe?" "Who knows?" Dad says, sitting at the end of Yevreyskaya Ulitsa. "How can you know with some things?"